This cast off is designed to be used on 1×1 ribbing and provides an extremely stretchy cast off with no visible cast off edge. This cast off is a wonderful match to the Alternating Cast On. 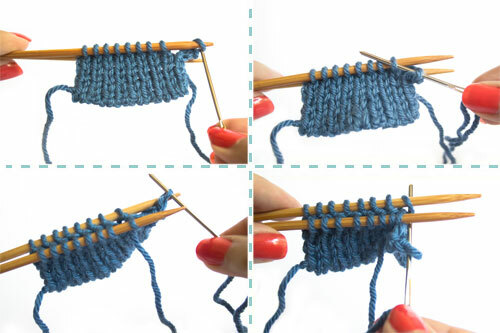 Start with your 1×1 ribbed edge, knit stitch first, held in your left hand, with two empty DPN needles in your right hand. 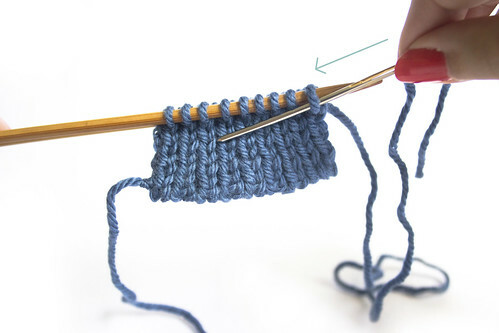 Hold one needle in front of the other and, starting with the front needle, alternatively slip stitches onto the front and then back needles, so that all of the knit stitches are placed on the front needle and all of the purl stitches are placed on the back needle. TIP: If you cannot fit all of the stitches onto your DPNs, or are casting off a project that is knit in the round, slip only a portion of stitches to the needle at this stage, bind those off, and then continue to slip more stitches to the two DPNs as you bind them off. If casting off something small knit in the round (such as a toe up sock or pair of mitts) it is easy to slip half the stitches to the DPNs in this and then work the second half of the stitches once you have bound off most of those waiting on the needles. 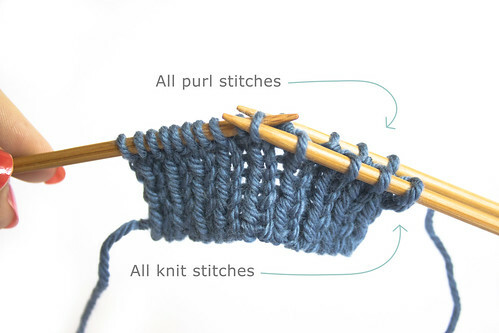 Once you have your stitches set up in this manner it is time to prepare your yarn. 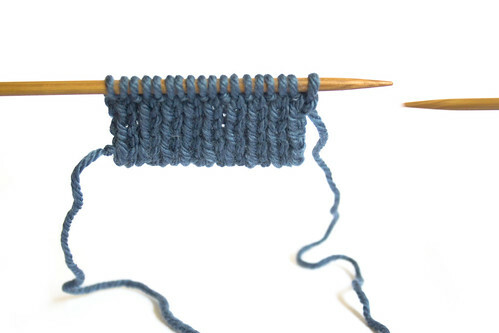 You will need to cut a tail of yarn about 3-4 times the length of your ribbing when stretched. Always err on the side of a longer piece of yarn if you are unsure. thread this yarn on to a large, blunt-ended knitters or tapestry needle. The next few steps should feel very familiar to anyone who has kitchener stitched closed a sock toe or two other sets of live stitches. 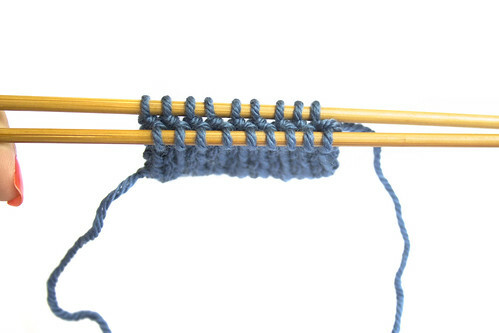 TIP: At first you may find it difficult to judge the tension of this bind off. I like to make the bind off extremely loose and then re-tension it stitch by stitch, tightening up the loops from the first stitch cast off, once all stitches have been bound off. Set up, step one: Pass the needle purlwise (from right to left) through the first stitch on the front needle, leaving the stitch on the needle. Set up, step two: Pass the needle knitwise (from left to right) through the first stitch on the back needle, leaving the stitch on the needle. Step one: Pass the needle knitwise (from left to right) through the first stitch of the front needle, slipping this stitch off of the needle. Step two: Pass the needle purlwise (from right to left) through the first stitch on the front needle, leaving the stitch on the needle. Step three: Pass the needle purlwise (from right to left) through the first stitch of the back needle, slipping this stitch off of the needle. Step four: Pass the needle knitwise (from left to right) through the first stitch on the back needle, leaving the stitch on the needle. Repeat these four steps, adding further stitches to your two DPNs as you go along if you didn’t place them all on to begin with) until you have completed step four and have only one stitch left on each needle. Then, repeat steps one and three once more. All stitches should now be bound off. 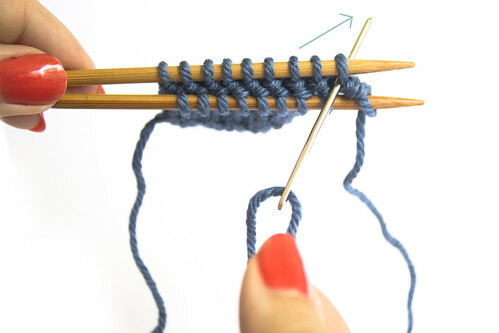 If you have completed the sewn bind off loosely, adjust the tension of your stitches to match those of your knitting one by one, until they sit neatly. The resulting bind off should be extremely stretchy and almost invisible. It’s absolutely perfect for items such as toe-up socks or anywhere that a neat and very stretchy 1×1 is to be maintained through the cast off. That is really neat! And your pictures and explanations made total sense- I think I will try this. Thanks. Happy day off Friday! I’m going to try this on a swatch because it looks like a great BO to have in my toolbox. Thank you. Great tutorial. Thanks Mimi, I wouldn’t have thought to do that. Girl, that is kitchener stitch. You’re not fooling me. It is brilliant though. Might have to try it with the socks I’m almost finished with. Yeah, it does say above that the steps are the same as those for Kitchener, though quite a different effect for the bind off. Great if you are already accustomed to Kitchener stitch, but still worth trying if you have never Kitchented, too. Give it a go: I think you’ll be imprrssed! Thank you for this tutorial, I bookmarked it ! It is very neat and much easier to follow step by step than with some video tutos. 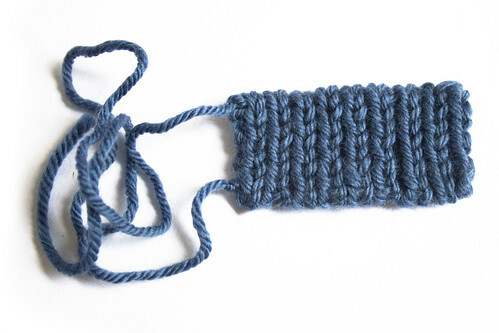 I am using this stitch to finish the neck of a cardigan, the result looks really professional. I tried to figure this out from videos and nearly lost my mind. Your step-by-step and pictures are wonderful and my sleeve cuff looks awesome! Thanks so much.